I started on lightening the Slingshot frame tonight and started out with a bend test to make sure lightening of the frame doesn't cause the frame to become structurally unsound. What I used to stress the frames was a spring scale and a dial indicator. I bolted the frames to the table with the proper spacers to simulate the front to back offset of the bottom of a boot. (see below). On the right is the weight scale, I used 20 lbs of stress for each test. 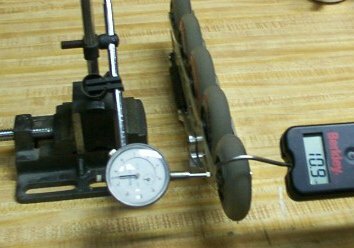 On the left is the dial indicator which tells me when I pull with 20 lbs of weight on each wheel how far the frame bends. I measured from the front wheel the middle wheel and the back wheel. The higher the number (measured in thousandth of an inch) the more the frame bent. (the second wheel back measured 17) but the back was the strongest of all the frames. I think if you put even pressure across the first and third wheel (which is what would happen while skating) the reading would be much better because when I tested I measured on either side of the clap hinge. 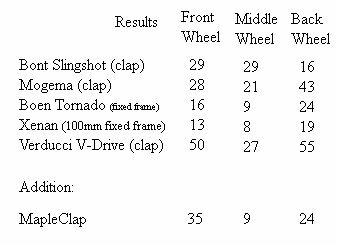 The back was the strongest on the Slingshot because the back two wheels are fixed (with an aluminum wall twice as thick as any other frame) as opposed to the Mogema and V-Drive where the back wheels open with the clap. The Tornado and Xenan were stronger than the claps due to being a fixed frame and wow, look at the Xenan. The Xenan was strongest except for the back of the Slingshot. 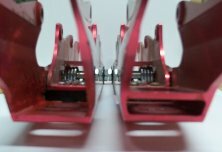 The V-Drive numbers may be high because it is a higher profile frame than the rest which makes it more vulnerable to side stress. First I cut the cross member out just below where the back of the boot mounts. In the two pictures below the left frame has the member cut out and the right still has the member in. This took out another 2 oz off the frame. Next I drilled the front half of the frame (see below). This took another 1 oz off the frame. Below are picts of what I took out of the tops of the frames but don't have before picts. (see below). In all I got 4 ozs off each frame which brings it down to 10 ozs which is acceptable knowing most fixed frames are at 8 ozs. I then rechecked the side loading after drilling, before: F29, M29, B16 after: F29, M29, B26. The front stayed the same but the back went from 16 to 26. Seeing the Mogema back is at 43 and the Boen back is at 24 and the Verducci back is at 55 I feel pretty comfortable with the Slingshot being 26. Now when I lift my skate to put it on I don't have to check inside to see of I left a roll of quarters in it.